It has probably got by you all, my gentle readers, that I have not made a review post of the August 2014 kit "Lazy Hazy Days" I had started back into the work force last August and of course the scrapping routine was the first casualty in the lessening of leisure time. But it nags at me that a reveal without a round-up is remiss. So today, I wish to rectify my failed responsibility. 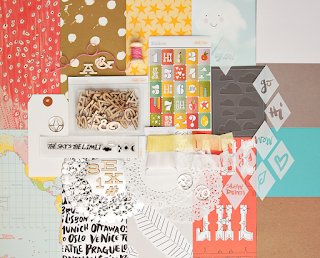 You will recall our inspiration kit, Studio Calico, Penny Arcade. My copy-cat kit was revealed here. oops, not that one. Chuckie is such a ham. Found on Facebook. An assortment of pictures of my long-distance grandson. Next, four layouts about Rebecca. Then a compendium on Kit Kat and her Last Litter, the Fabulous Four. These one page layouts will be back to back in my pets album, with the over sized tag page held between. The rose will peek out as a pull tab. "Of course she is fixed!" I was assured by my mother, when she moved to Athabasca in the spring of 2008, that the cat she was leaving in my care (Kit Kat) was spayed. Weren't we surprised the next spring when she delivered four balls of fluff. Kit Kat was ornery and unpredictable. She would just as soon swat you as let you pet her. She was trying to hide the kittens so they wouldn't have contact with people. I did not want them to grow up untamed and fearful of folks so after the second game of hide-and-seek, I closed them up in the bathroom. Daily contact with the fluff balls resulted in a quartet of cute cuddly kittens. At two months they were all relocated to the Griffin farm. Alas, they escaped before they had recognized that this was their new home. Kit Kat got her way and isolated them from human contact. But we fear she did not or could not protect them from the wildlife in the area. We never saw them again. Journaling added after photo was taken. I don't really understand my compulsion to take pictures of clouds, sunrises and sunsets. The captured image never serves justice to the original. Also I don't know why I end up creating layouts for so many of these moments. Suffice to say, it gives me joy. Journaling was added after photo was taken. I really love to read stories about women in the north. One day I plan to go "there" and have my own adventure. There now. I feel so much better.I can continue scrapping and blogging about same without the nagging voice in my head. What a wonderful round up. You never fail to make me smile, nod, laugh out loud or just be happy that I "found" you! A wonderful selection of layouts - all those photos! Of course, I love the layouts about your sweet Rebecca - isn't she beautiful and that one of the two of you :-) Just darn cute, you two! So lovely to see you scrapping. A lovely recap. How fun! I love "Kill A Kit" posts!